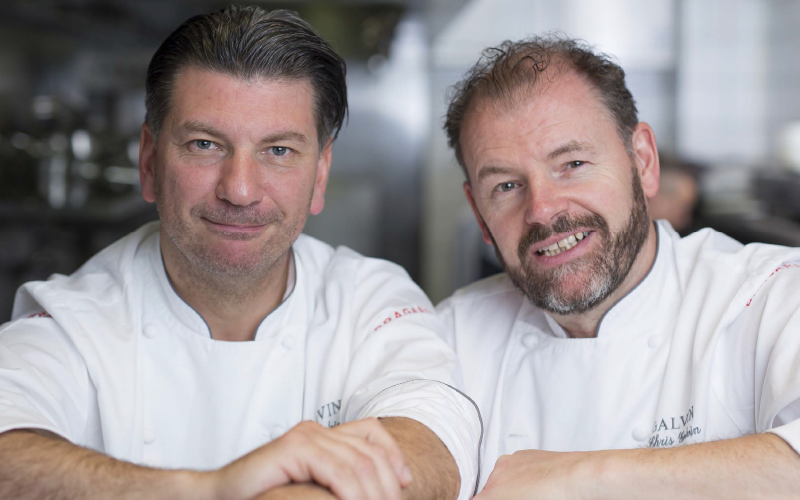 Equipped with an impressive Michelin-starred career, sibling duo Chris and Jeff Galvin land in Dubai to launch two new restaurants at City Walk. BBC Good Food Middle East caught up with the brothers to learn more. Last month, Demoiselle by Galvin, a continental style all-day café opened doors to serve an array of artisanal delights for breakfast, lunch, afternoon tea and dinner, while a second outlet (which will be licensed) will follow later this year to offer more of a fine dining experience. This is Demoiselle’s first debut outside of the UK, where its original outlet was first launched at Harrods, London in 2012. The concept offers a vibrant, cosmopolitan setting and luxurious simplicity with bread and viennoiserie handmade on-site. You’re both in town to oversee the opening of your new restaurant. What attracted you to launch in Dubai of all places? Chris: We think it’s one of the most exciting destinations in the world. Dubai is definitely up there with Paris, New York and London in terms of food capitals of the world. Galvin Restaurants is an ambitious, young company and we just felt like we should be amongst the culinary development in Dubai. We love it here. Jeff: Since my first trip to Dubai around eight years ago, the amount of development that has happened is just amazing. People talk about the restaurant market becoming saturated here, but I disagree with the idea that this is a negative thing. Places like Dubai and New York is where you’ll find the best restaurants, because to survive you have to continually strive to be the best. Where if you haven’t got that mass, the restaurants that aren’t so good survive, because that’s all there is. In this industry, you’ve got to be constantly relevant, evolving, and on your best game to ensure you’re successful – and Dubai offers that exciting and competitive platform. Talk us through the concept here at Demoiselle by Galvin…. Chris: Well Demoiselle has a very feminine angle. The inspiration behind the concept came from a beautiful chateau that I’d previously seen in Champagne with my wife. It was an art deco building that was just stunning. Inside there were beautiful drawings of young Parisians in lovely dresses, all in very pastel colours with sun umbrellas, and paintings of beautiful birds of paradise, and we just fell in love with it. In terms of the food, it’s small dishes, sharing dishes, breakfast, elevenses, lunch, afternoon tea, supper – or just a beautiful spot to stop for a refreshing drink. We hand make everything. We don’t buy anything in. Upstairs we have a bakery, where even our chocolate is made from scratch. We’re bespoke and offer high-quality food. How will Demoiselle Dubai fare in comparison to the London based Demoiselle? Chris: The one thing we do is make sure our restaurants all have different offerings. With Demoiselle, we have adapted a lot of our recipes for Dubai. There’s a few of our classic, signature dishes on the menu here that people recognise and we’d never take off the menu or change, but overall, we’re doing more spice work with the dishes here, and the food’s a little bit lighter in terms of cooking methods – there’s a lot of ‘cuisine of the sun’. London’s menu offers much more warming bites for people coming off the cold streets. What’s different here is there’s so many different facets; we have a juice bar, coffee bar, the retail aspect, the all-day café, and upstairs, which is much more about afternoon tea. It’s a great place to gather, you’ve got a bird’s eye view off the terrace – where you’ll see light shows from in the evening – there’s always something different going on and something to look at. And, from the retail side, you can easily pop in when you’re shopping and pick up some bread, juice, chocolates and off you go. In your opinion, what makes a restaurant successful? Jeff: We love going to Zuma and La Petite Maison, and if you look at why they work, it’s because the quality is there, the service is there – people want that “I know what I’m going to get” sort of offering. It always delivers, it’s classic and it’s consistent. That’s what we’ll be offering here. Chris: Restaurants require constant care and attention, and the minute you stop giving them that, they crash. That’s why we pride ourselves on having a strong team. We’re all family at Galvin Restaurants and our team have been with us for a long time – so when we’re not here on the ground, we feel more than reassured that things will continue running the same way as if we were here. Jeff: When we arrived in Dubai, walking into the restaurant was like coming home cause we’re so in touch with the team here. It’s vital to any restaurant to have a solid, consistent team behind it. How regularly will you two be visiting Dubai? Jeff: Five or six weeks each year, and we’ll probably split it up so that at least one of us is making an appearance every month or so. Chris: The team that we’ve got in the kitchen here have all run restaurants before, so they know the drill and will do an absolutely fantastic job whether we’re here or not. Looking at trends in the culinary industry, what do you think the consumer of today wants? Jeff: We’ve got Michelin starred restaurants and we don’t want them to be starchy – and neither does the consumer. It’s great to see a move away from stiffness. So many places now focus on music and a relaxing atmosphere – we love it. Chris: I’m the oldest in the company, but I think I’m the youngest [laughs]. But seriously, I like technology and so do most diners of today. They want handheld technology in a restaurant, they want privacy, they want their drink served quickly, their food to come on time – hot if it’s hot, cold if it’s cold, fresh and clean, and they want you to give them space. If they want to engage with you, they will. If the front of house staff get it wrong, they can ruin a dining experience. What would ‘must try’ menu items would you recommend having at Demoiselle Dubai? Jeff: The steak tartare is something we’d recommend. The lobster fishcake – we put it on at Harrods and couldn’t take it off because it was ordered that much. Where are you sourcing your ingredients from? Chris: Quite a lot from Wet Fish and Classic Fine Foods, which is one of our current suppliers in London too. And in terms of local, to be honest I think it’ll take us some time to find our feet with the local market. Figuring out what’s good, what’s not. There’s a constant evolution of ‘where can we get this better’ and with the demand here, it’s getting easier and easier to source great ingredients from all over the world. Jeff: It helps how much the media informs the public these days about quality ingredients. The consumer nowadays is aware and demands the ingredients they want to see on their plate. This really helps us in terms of sourcing, because the demand is there. Chris: There’s no place to hide these days. I love the transparency with food that the media has created. Chris: Yes, we think September/ October time, also located in City Walk. It’ll be a bit more of a fine dining concept, which will be licensed. It’ll have a nice big bar as you walk in where you’ll be able to enjoy drinks and small bites, and then a more formal three-course meal in the restaurant. Again, it’ll be more adapted to the sunny climate. We like to use the term Mediterraneanbasin – combining Spain, South of France and Italy. It’s like a horseshoe of cuisine from those places that we’ll be offering. And then upstairs, it’s a lounge with funky music. Jeff: It’ll be located alongside three other restaurants and it’ll be a great area for a fun night out. You can move between the bars via a little walk way. There’s Lima there now, and more to come. It’s a lovely spot. Chris: It’s a one stop spot for enjoying an aperitif, dinner, a few drinks in the lounge and then a dance. Taking it back to the beginning, what got you both started in the industry? Chris: Well, we’ve always loved cooking. We come from a big family, our Gran has nine children, all of which have three or four children each, so often on a Saturday around my nan’s there’d be 30 to 40 people. Nan always had something cooking – a stew bubbling on the stove, a pie in the oven and she made her own bread. She also grew a lot of her own fruit and veg, and she’d take us around her garden telling us what was ready to pick. She really influenced us a lot. We started in restaurants when I was 15 and Jeff was 12, helping on weekends and we got the chef bug. Jeff: After culinary school and years of experience, Chris was a director at the time and I was working for Marco Pierre White – we both had great jobs, but a penny dropped and we decided it was time to do something together while we were both still young enough. We went for a little backstreet bistro initially, and it just exploded – then it all took off from there. Chris: Well, we never say never, but we’ve got a lot going on at the moment, and the concepts we’ve just opened need our devoted attention now. So, nothing else is on the cards for now – but who knows what’s around the corner. Jeff: Exactly, never say never. If someone told us when we first opened our little bistro that in 11 and a half years we’d have 12 restaurants internationally and 750 staff – I never would have believed it. It’s been great, and we’re excited to see what’s to come here. For more information, visit Demoiselle in Dubai.